These are the people who, for want of a better term, administrate Snowplains. They edit the code, and the messages which users see; maintain the web and ftp sites; and also have the most control on the talker itself, being able to banish and nuke players. 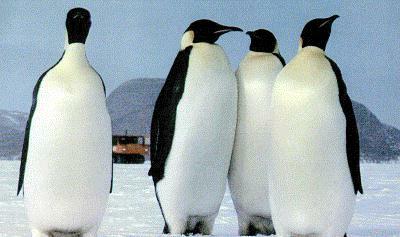 The largest living penguin on the planet, and one of the two members of genus Aptenodytes. It is a colonial species and is found primarily in the Antarctic. This is me. I'm called Berry because I have delusions of being a Ribena Berry. I used to do most of the coding for Snowplains although that's dropped off a bit now. This is not me (well, you never know). It was his idea to start Snowplains and he's certainly one of its biggest users. Jarel now does a significant amount of the coding on Snowplains, and has worked greatly on its stability rather than adding new features, resulting in one of the most stable talkers around. The other member of the genus Aptenodytes. Also colonial, and also found in the Antarctic. The name Aptenodytes means "featherless diver". Marble is evil and don't let him tell you otherwise. He also does a significant amount of coding on Snowplains and is responsible for a number of fairly transparent but crucial features. Pling is what non-spods call an exclamation mark. Some spods would prefer to call her a shriek, but that's more likely to be what you'll do if she takes a dislike to you. Watch out for her heels, they're vicious. One of six members of the genus Eudyptes, all of whose heads are marked by colourful crests or aigrettes. Some people do not consider Royal penguins a separate species but merely a geographically distinct "race" of Macaroni penguins (Eudyptes chysolophus). The name Eudyptes means "good diver". Gribble, pronounced "Gerbil", has too many cars for his own good, but prefers some exercise in a modified hamsterwheel where possible. Hobnobs are nice cookies to nibble on, but please leave some for assisting the newbies. Marnanel can help you out with everything (but be careful of accepting a mail order bride from him). He was far too tall to be a normal user, so we promoted him. Regarding Phlebas, well, he's been spodding for years, and must know how to help you by now. Marble was getting lonely, so we promoted another rock. Thorin is not only a royal, but he was our pet site admin for ages, so be nice to him! One of six members of a packet, costing a nominal sum from your local grocery store. Noted for their wide variation in colouring, including blue, yellow, red and green penguins; also noted for the bad joke that polar bears don't eat them because they can't get the wrapper off. The name Biscitus means "crunchy baked mixture of flour, sugar and butter". They're very nice to eat. They're also the penguins who help the newbies who log onto Snowplains and are generally all round nice penguins. Which is why we called them Chocolate Penguins. It wasn't because we ran out of suitable real penguin names or anything, not at all. No, really, it wasn't. Honest. Oh, OK, it was. So shoot us. We don't have any Chocolate Penguins at the moment! © Copyright 2007 Snowplains Admin - snowadm@snowplains.org.